It’s no longer a secret: San Sebastian, European Capital of Culture in 2016, is a gastronomic gem in a land of spectacular food. If you’re planning on spending 24 hours in this city you’ll need to loosen your waistband. Sure, Spain has a glut of fantastically picturesque cities and some of the best food on the planet, but San Sebastian known as Donostia in the Basque Country, might just be the jewel in the crown. The city is also very compact so you will be able to walk from one side to the other relatively quickly. If nothing else, bring your swimming gear and comfy walking shoes. La Playa de la Concha beach, with its golden crescent sweeping from Parte Vieja (old town – the heart of the city) in the east to Monte Igueldo in the west, is a wonderful feature of this city. It is probably one of the finest city beaches in Europe, probably the world, you’ll want to spend a while splashing in the sea or people watching. And let’s not forget Playa de Gros (also known as Playa de la Zurriola), a favourite with surfers. But to get the picture postcard view you’ll need to head to the funicular up to the top of Monte Igueldo. A €3.15 ride takes you to the antiquated but charming funfair on top of the hill which offers views that can accurately be described as ‘breathtaking’. We also went for a ride on the rickety roller coaster and climbed ‘The Tower’ for even better views. All the attractions are about €3 each for adults. Food wise, San Sebastian is akin to a culinary sweet shop. The old town (Parte Vieja) is studded with wood-panelled bars sporting unpronounceable Basque names such as txepetxa and etxberria. Passing each one you’ll spy little gastronomic works of art lined up along the bar. These are pintxos (pinch-os), the local variety of tapas and it is these that give the Basque region their rep for quality food. Each one costs around €2-3 and it can be tempting to get stuck in and spend a fortune. Our favourite pintxos bars were Bar Zeruko, where everything on the bar looked picture perfect and Bar Azkena, which is down a flight of stairs hidden in a market near the local Lidl. Top tip! Order from the specials board. We had slow-cooked veal cheek with foie gras and a lobster morsel served in a shot glass with dry ice (don’t drink the dry ice!). 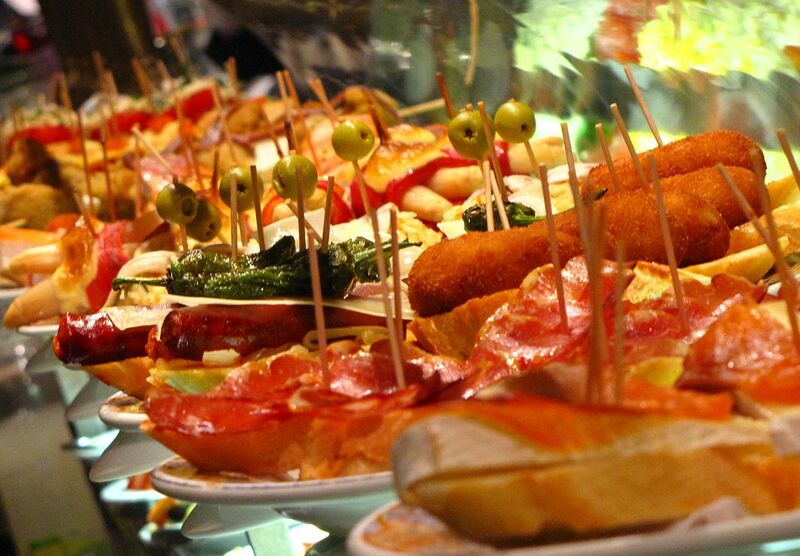 But our advice is treat the pintxos like an appetizer and head to one of the many Michelin starred restaurants in town. There is a splendid selection. Arzak is the most famous of the three Michelin starred restaurants on offer. But you’d be hard pressed to choose between them, Akelarre or Kokotxa. We sampled the fare at Narru for their exquisite lunch menu. Bookings are recommended at all the restaurants. The Basque’s are a proud lot and they’re justifiably proud of their unique booze options. Just ask any barman what he recommends and the answer will be one of these. Txakoli (cha-ko-lee) is a tangy apple wine which is poured with a flourish – a cascade from a great height into a small glass. Don’t try and do it yourself! The local cider (cidra) is also a must try. 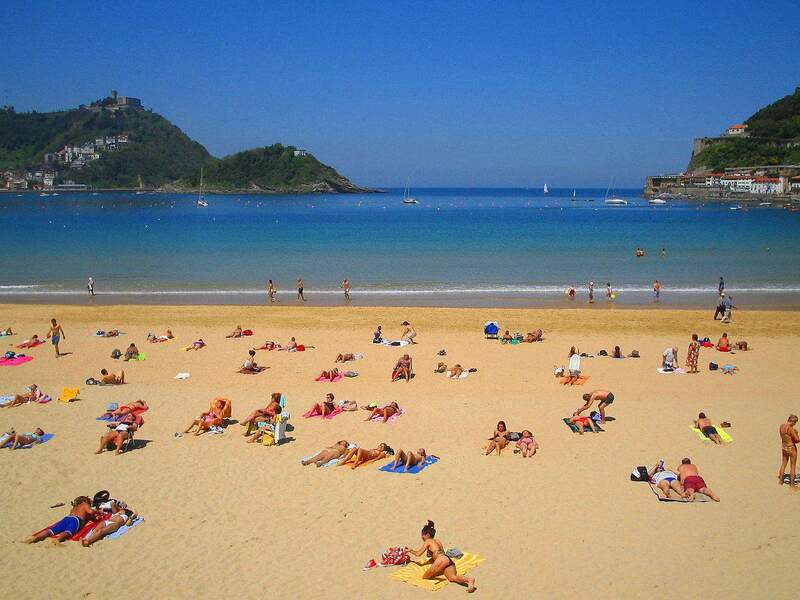 If you’re not a cider drinker then if you only try once, do it in San Sebastian. A literal stones throw from La Concha beach, Hotel de Londres y de Inglaterra is a grand and palatial looking building in the heart of the city centre. The rooms are cool and light with a chic modern finish, despite the classical exterior. The location is ideal for the 24 hour visitor, with the old town a 10 minute walk, the beach barely 2 minutes and the main shopping area on the doorstep. The bar in the hotel also overlooks the beach so you can watch the world go by over breakfast.